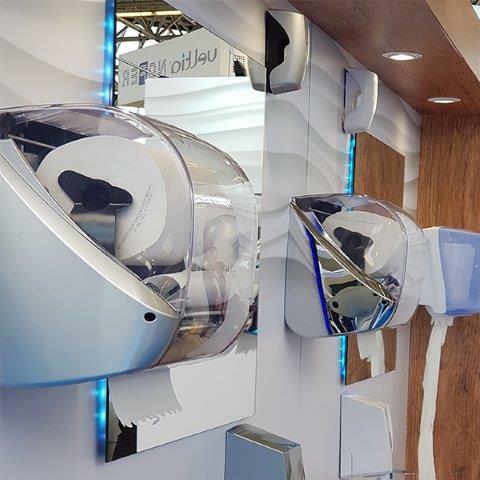 Kennedy Hygiene Amsterdam RAI 2018 Wash and Restroom Hygiene and Dispenser Range. Australian distributors Blue Tongue Industries. What a show. Another year has gone, and Blue Tongue Industries were luck to attend, the prestigious event. The show did not disappoint, with Kennedy hygiene spreading its wings across a very large area at RAI. On show was a full range of Wash Room, Rest Room Soap and Foam Dispensers as well as a vast range of Air fresheners and all the Feminine Hygiene, Medical and Nappy bin ranges. The Blue Tongue Industry team made time to visit the factory in Uckfield UK. Once again taken back by the way in which the operation was set up. From the large room of professional engineers to the testing laboratory, and then onto the floor to meet the many involved in assembly. A very happy and pleasant environment, this was soon realized with the long stand staff that many had over 20 year within the company. With its European main company Elis and the infrastructure that its has on its extremely large market share in Europe. It is easy to see the quality, expertise, range of equipment that Kennedy Hygiene produces, and why it is a market leader. Blue Tongue Industries has been humbled at the relationship we have developed with Kennedy Hygiene, and the role we have in front of us for distribution into Australia. We will be graced with Andrew Cawthorne visit to Australia to attend our stand “Blue Tongue Industries” at this years 2018 Sydney Interclean ISSA show. Andrew has vast experience across over 100 destinations world wide as supporting his distribution network. Andrew will be a valued asset to have here says Gordon Cornish. If you would like to know more about Kennedy Hygiene and all there products please check in at www.bluetongueindustries.com.au Here you will find the full range of all hand drying dispensers in paper, cotton, as well as there foam and liquid soap hand cleansing range. The feminine Hygiene bins in manual, foot operated, or sensor, along with the top selling globally air freshening range can all be viewed.